Sometimes it's not so easy to seperate the wheat from the chaff; especially so if one doesn't have any reference points for which to evaluate it. These days, everything seems to be made in China, and there is no escaping that so it's someting we should accept. Chinese-made products often have a stigma attached to them, often being thought of as cheap 'n' cheerful (to put it nicely), but in fact there are a lot of very well-made products that come out of the People's Republic. It's just a shame that there are so many duff ones that make it out of the country. Cavalvy headsets are made in China, although looking at it one can easily appreciate the quality of construction, as it has been clearly made to last. 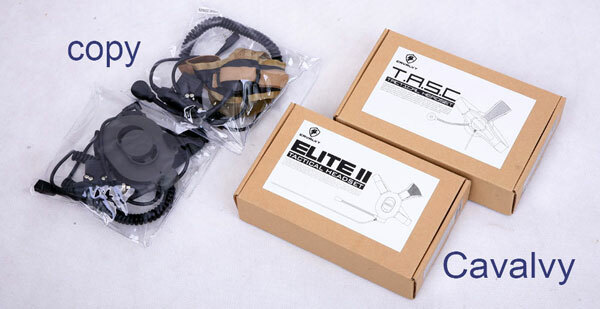 The Cavalvy headsets have proven to be very popular for their cheap price and also because they are very well made. However, recent times have shown that the cloning culture has proven to be a booming business, as it offers up cheap cheap prices for products which are based on other popular platforms. The trouble with this is that the quality of some of these "clones" are somewhat questionable and some are undoubtably laughable. Brands such as Pantac have been plagued by a flood of copies/clones that have entered the market, using the Pantac name, but were never made by Pantac (see article). Pantac have done quite well to build up a reputation for mil-spec quality combat gear, so it's a shame to see their brand image tarnished by inferior copies. You'd think that you can't go wrong with plastic, right? Well, the Cavalvy copy uses a much inferior plastic that flexes and has significant torsion when put under pressure. The originial Cavalvy uses a highly durable plastic that is picked for the purpose of prolonged use. The ear padding on the copy is pretty dire too, lacking the ability to retain it's shape after use. Press down on it and it ends up like a freshly-squished piece of road-kill, flat as a pancake. They are also not very comfortable to wear either. The original Cavalvy, well, let the photo speak for itself. Simply superior. 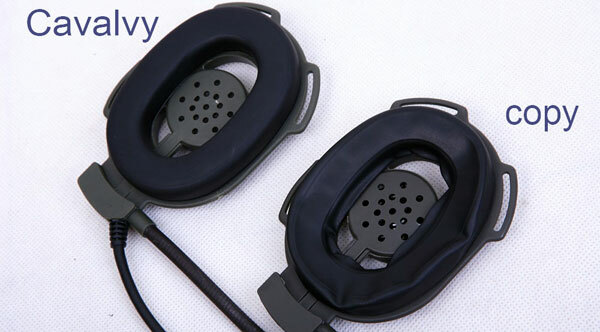 When you buy a Cavalvy product, ensure that it features the Cavalvy logo on the outside of the ear-piece. The real Cavavly ear-piece is actually locked into place securely with an inter-locking method, while the copy uses glue only to keep it in place. The authentic Cavalvy products come with cardboard packaging with logos and cover art. At the end of the day, it's entirely up to the consumer when they buy a product. So the decision to go for a clone, copy, whatever, is not for us to decide upon. However, we thought it would be useful to let you, the consumer, know about some of the duff products out there. Especially those that pose as a real brand, which has another moral dilemna in itself. All Redwolf can do is to give advice, to shop smart and know what you're getting, as there seem to be plenty of these scams popping-up lately. Then you will be able to separate the wheat from the chaff easily. We deal with Cavalvy directly, so you can assure yourself that you are the getting the real thing when shopping with us.